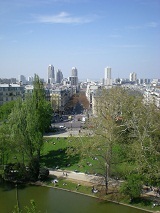 Greetings, dear readers of An Alien Parisienne! Sorry it has been a couple of weeks. The good news is I have been out, living life, and as you know my motto is, “Life first, blog later.” I’ve stolen that motto from a long time online friend, Bonii Jo, to give credit where it is due. It’s true, though, that if I am not writing here, it is often because I am “out there,” doing things. Or, perhaps more truthfully, I am on the internet superhighway reading as if I am in a 1994 Dauer 962 LeMans (allegedly the fastest car in the world). The sheer number of open tabs on Google Chrome turns into a solid bar of color where I cannot even see the icons of what is on each tab anymore. Hunting down a web page becomes a game of guess and click, or maybe hit and run, to keep with my superhighway metaphor. I try to use things like Read It Later to little avail. I like to read anything and everything I can get my eager little fingers and eyes on, and inevitably my brain gets clogged up with all of the mental commentary about said readings and all they inspire, and before you know it, I am blogging here. It’s like a brain detritus bomb most times. A blowout on that superhighway when I actually stop to contemplate in writing what I have in mind. I was the kid who always had something to read in front of her. I read the cereal boxes at breakfast. I read the billboards on the way to school on the schoolbus. I read everything set before me — I even passed that stupid little “pop quiz” that teachers used to give where it says at the top of the test in the instructions, “Before you do anything on this quiz, read ALL of the questions FIRST, then begin to work.” Then the last question says something like, “Only perform the task in item number one, and ignore the rest of the questions and/or tasks on this quiz.” The task in number one is to write your first and last name at the top of the paper, and that’s it: end of quiz. It was the kind of quiz designed to make most kids feel like idiots, laboring over the questions they didn’t even have to do, if they had read the directions. But of course a good percentage had not followed the directions (kind of the whole point of the quiz — to hit kids over the head with the idea that it is always good to read the directions first) and it quickly became obvious who had and who had not done what they were supposed to. I remember teachers sitting, smugly, at their desks, chuckling silently to themselves over the fact that they duped kids into needless work. I remember the audible groans from the children who realized the error of their ways in not taking care to read the directions first. The whole thing boiled down to rewarding readers and rule-followers such as myself, and shaming the ones who were more renegade in their approach. Still, I am the one who can actually set the timer on the DVD (used to be “the VCR” and I almost typed that — god I am getting old. More on that in a mo’) because I READ THE FREAKIN’ INSTRUCTIONS and therefore know what to do and how to do it. What I am getting at is that I love to READ and with the interwebz at my disposal, it is like quick and easy crack almost all day long at the crack whore house of endless crack. Until the man of the house gets home and wants his due time on the ‘net, too. He is more of the writer, though. And the organizer of media for his writing. I, on the other hand, cannot seem to stop reading long enough to write, and then when I do: KABOOM. Here we are for another explosive installment of the life and times of Paris Karin, the Alien Parisienne. My last post was a bit long, I decided, lol. I love the way WordPress allows one to track from where folks are coming to visit: I got looks from web searches on the Canauxrama, Marion Cotillard, and the movie “Whatever Works.” I realized though if I were someone who was looking for information on these things, they would have to *really* search my posts to come up with the info… Anyway, it reminded me that brevity in posts is often good. I will try. Not making any promises as I am not Hemingway (Proust or Dostoyevsky is more like it, as I like to say), but I will try. Beautiful, yes. But it’s remote. 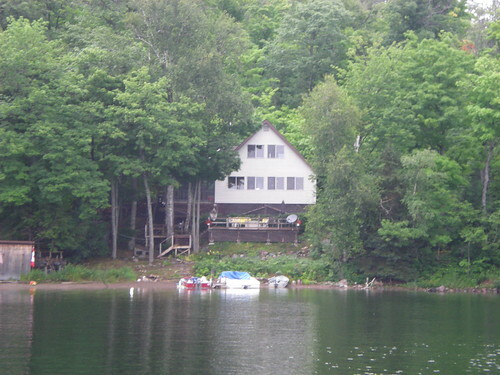 No electricity, three full weeks of being separated from my life-saving Internet, photography, Flickr, and blogging! Eek! There is a fridge running on propane and hot running water, too, and yes, it will be a challenge for me on a physical level (with eating the way I do out of my comfortable environment I have created for myself here in Paris) and an emotional/spiritual level (OMG, I am going to just have to BE a whole lot… Sometimes just being with ourselves and our thoughts produces anxiety, eh?). I’ve been worried about traveling and eating gluten-free, but have been on searching on the web at a variety of sites on this topic, especially to the blog of the wonderful Tiffany Janes at the Examiner (in my blogroll and here), and have amassed ideas on how to handle this. A little more on that in a moment with another recipe I have tried from Elana’s Pantry. Anyway, THIS IS MY LAST POST FOR THE COMING MONTH. I will not be able to keep up the posts while in Canada, so even though this blog is in its nascency, it is going on hiatus for a bit. Full report when I return about how it all went. 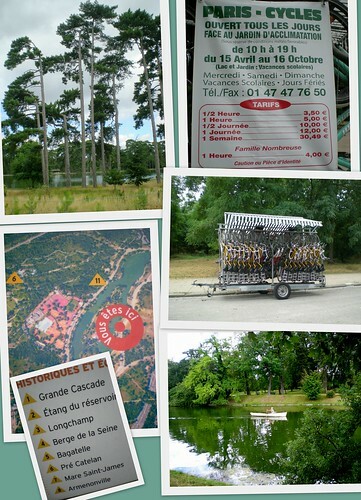 The heart of this post, however, is the trip I took to the Bois de Boulongne on Saturday, 25 July with my friend, Tess. I’ve got the whole story posted on Flickr, too, but I am reprinting it here. 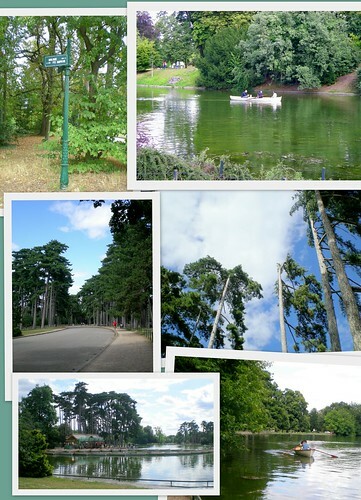 WHY THE BOIS DE BOULONGE? 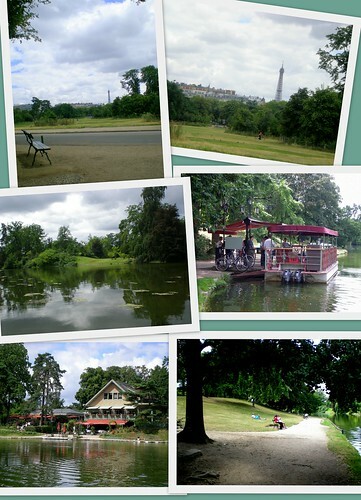 The Parc Bois de Boulonge is just to the west of the Boulevard Périphérique, which is the freeway encircling Paris proper. 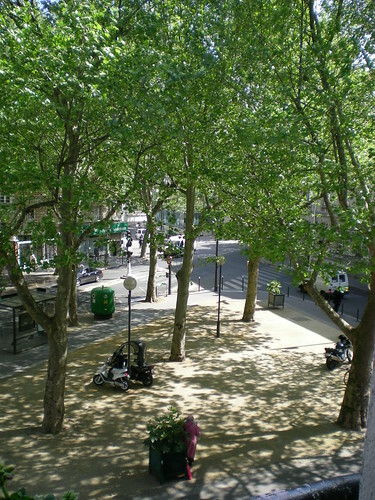 The 19th arr. (upper right of the map) is where I am living. 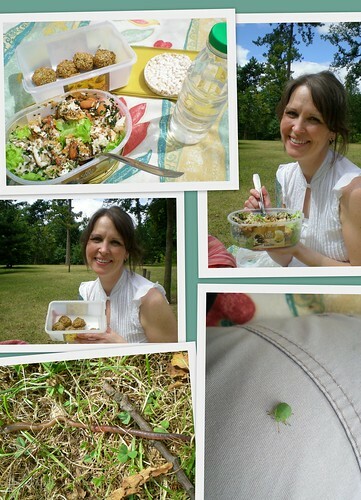 On Saturday, 25 July, I met my friend, Tess, in order to have a picnic lunch in the Parc Bois de Boulonge in Western Paris. The Wikipedia article here: en.wikipedia.org/wiki/Bois_de_Boulogne gives a lot of information about the park, including its size, location, and historical background. and paris1900.lartnouveau.com/paris16/jardins/le_jardin_du_ra… — in french, but has some nice photos), where we saw a statue dedicated to Jean de La Fontaine, en.wikipedia.org/wiki/Jean_de_La_Fontaine, France’s answer to Aesop. 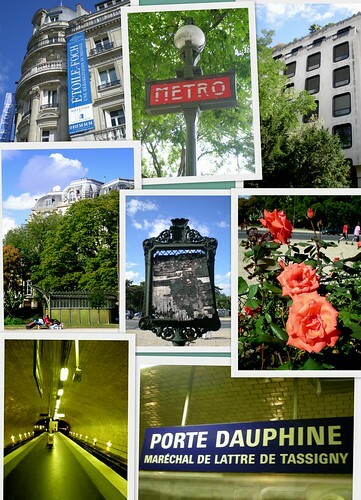 We turned north on to Avenue Raphaël and headed to the Place de Colombie. 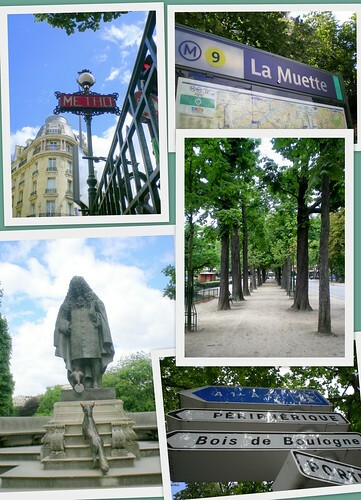 At the Place de Colombie, just near the Porte de la Muette on the east side of the park (towards the middle of the park, north-to-south), there was a monument (trying to find out of what… but no luck so far. I will check my other photos. Obviously it’s something military-oriented!). We crossed the Périphérique (which Tess told me is pronounced a little like “Perry Ferr -eeek!” or also – as I saw it in my mind’s eye – “Perry Fairy-eek” and had me giggling), the highway that rings Paris. 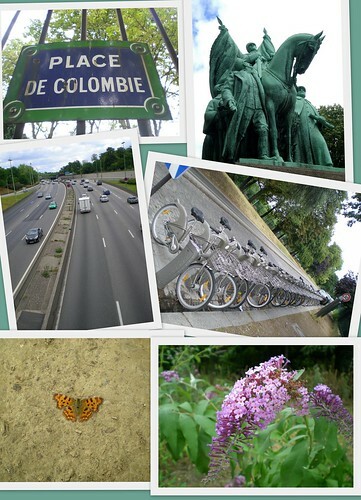 We saw a Velib station (bikes for rent as a city-wide program in Paris) and a beautiful butterfly (live) on the path we were on. Also there were some lovely lilacs. It was magical to cross the Périphérique and into a natural setting! “Bois,” I learned, in French means “forest” and it is a forest-like park. There is a very tall variety of pine here. They look a bit like lodgepoles, but they are taller and have different kinds of branches. They were interesting to take photos of because of their height and the silhouettes created by the partially-cloudy weather we experienced. Bikes are for rent at the park at stands such as in the photo, and the rates are reasonable. 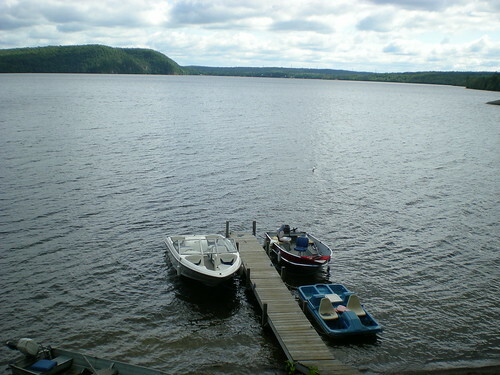 Boats for rowing can also be rented. We came to a large map of the park and a listing of all the places to go. 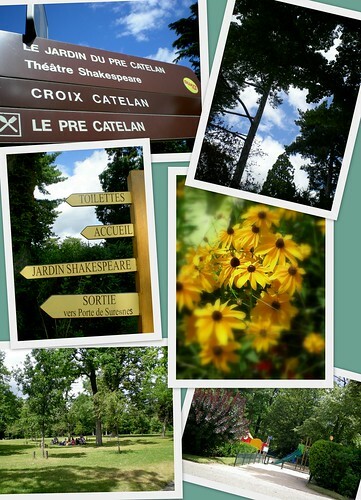 There are “mini parks” within the park, and we were headed to the Pré Catalan (6 on the map), which means the Catalan Field. 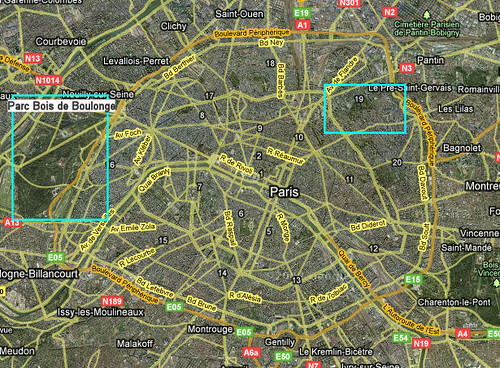 The arrondissement that borders lot of the park is the 16th, the same arrondissement containing the Eiffel Tower. 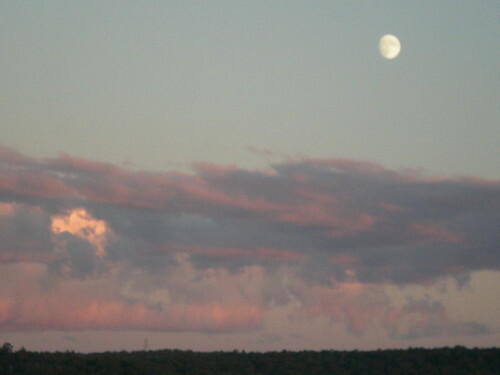 It was visible to the east of us, and I got a couple of photos of the top of it in the distance. A path lines the entire of the largest lake in the park (there are a few). A pontoon boat ferried passengers to a restaurant we passed on our walk to get to the Pré Catalan. 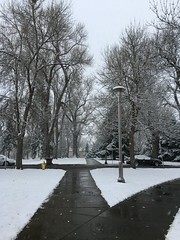 It was a beautiful walk on the way to the section of the park where we wanted to have lunch! 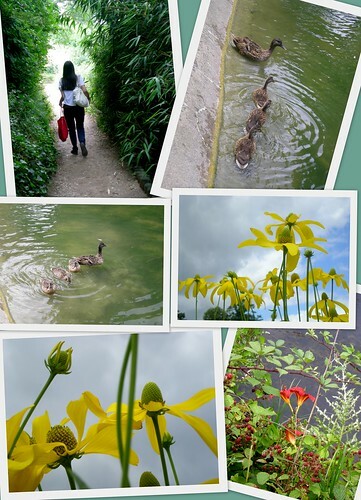 A family of ducks was enjoying the water, and flowers were everywhere! In the bottom-right photo, there were what looked like wild blackberries growing. They are red in the photo here, but there were some dark purple berries, too, that were more ripe and looked most like blackberries. This section of the park also had a children’s playground in addition to pretty floral beds arranged at various points in the park. 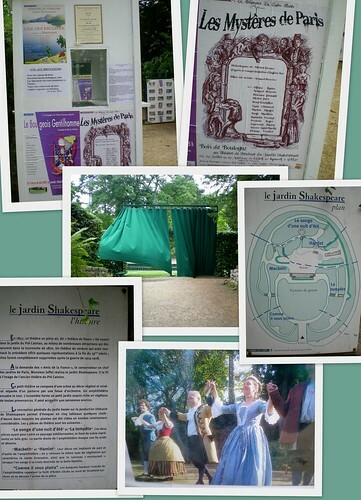 Here is the ticket kiosk for the Shakespeare Theater, a poster to advertise an upcoming play, and the entrance to the theater. It was closed when we arrived, but Tess read that from 2-4 Monday to Friday (maybe just in the summer?) it is open to look at. The map pf the theater is on the right. There are different stages and sections of this theater, too. There is more information in French on the history of the theater — the photo on the left is duplicated in this set as a single photo, so if you want to try out your language skills, you can go to that individual photo and read. The bottom right picture is a photo-of-a-photo from a poster showing previous performances. 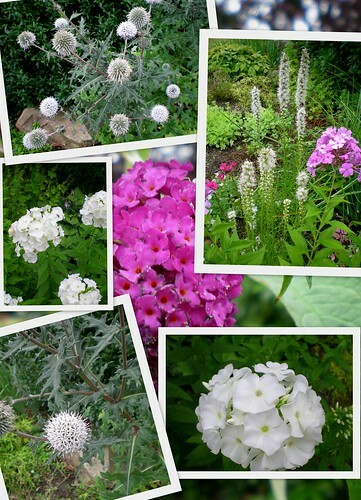 There were lots of flowers and lots of busy bees collecting nectar. LUNCH! I brought gluten-free fare: a salad with chicken, almonds, sunflower seeds, pumpkin seeds, sesame seeds, and for dressing I poured a little coconut milk over the top and added some tamari sauce and ground pepper. I threw some brown rice on the salad, too. Also pictured are some sugar-free, flour-free macaroons I made (see previous blog here: analienparisienne.wordpress.com/2009/07/24/the-week-in-re… (look under the header TUESDAY, WEDNESDAY, THURSDAY). 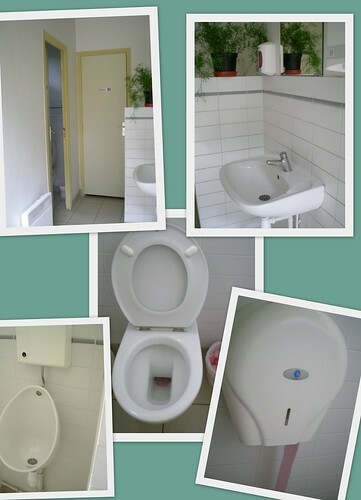 After a leisurely lunch, we headed for the restrooms. 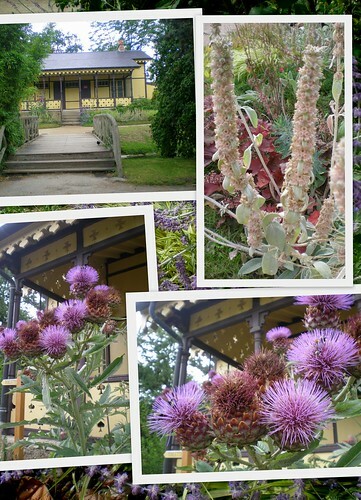 They were housed in a cute little gingerbread-look cottage in front of which was a fabulous thistle plant and other plants and flowers, too. Tess and I stopped to take photos of one another. 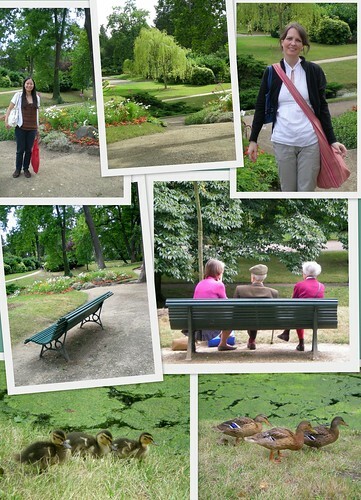 People, mostly elderly, were sitting and enjoying the very comfortable day (not too hot and not too cool), and we came upon another family of ducks, babies and mothers. We headed north of our original point of entry to the park towards the exit closest to M° Porte Dauphine. On the way out, we saw more people rowboating, jogging, and relaxing, and more very tall trees. We also passed one of the locations to rent rowboats. 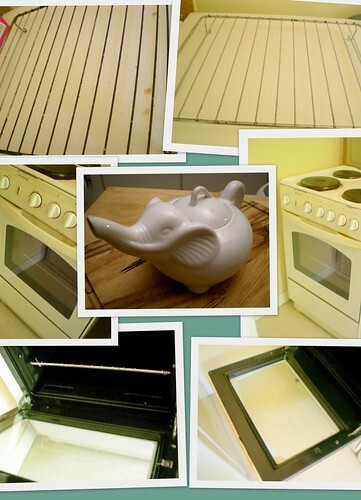 On Sunday, 26 July, I decided the oven needed a good cleaning! It wasn’t until after I’d started that I decided to take some before and after shots, so I don’t have any photos of how grungy the oven door had become. But what resulted was a shiny, clean oven, still a little “used looking” in places, but much cleaner than before! They had a whole selection of porcelain goods for sale and it was a great store in which to browse! 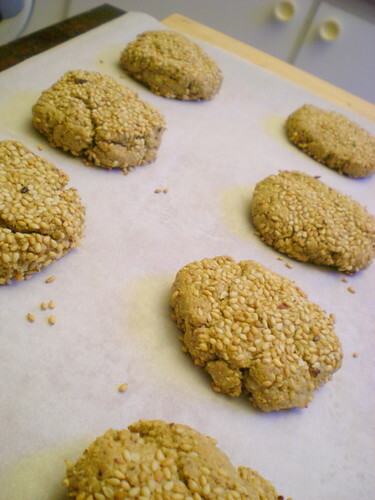 In an effort to try out recipes for snacks I can bring on my trip to Canada (for food on the plane and in the 8 hour car ride to our destination), I decided to try this sesame cookie recipe from Elana’s Pantry: SESAME COOKIES. Here are my adaptations to her recipe in which she uses agave nectar. I’m still not doing well with fructose, glucose, and sucrose, so I adapted this recipe by adding an organic egg (I can do eggs in small amounts) and a teaspoon of ground stevia leaf, the green stuff, in place of the agave syrup and they came out very acceptable! I write “acceptable” as they were not very sweet, more savory with the stevia not being super-sweet in the amount I used, and I used unroasted (raw) sesame tahini, which has a slight bit of bitter bite to it when used in cookies. The bite remained after I first baked them (I had one after they had cooled about 10 minutes) but the ones that were left the following day (! not many were, lol) had mellowed with their bite somewhat. Either that or my tastebuds became immune to it with each subsequent cookie. I’m hoping to try these again using maple syrup as I will be experimenting with my tolerance to it next, and I have a feeling they will be even better, but if there is anyone out there who needs to stay totally sugar-free (no sucrose, fructose, etc. ), these do bake up all right using a teaspoon of stevia leaf and an egg! OVER AND OUT until I am back from Canada!